Although the picture was wildly popular amongst their fans (they received over 5,000 “Likes” in a short period of time), the status didn’t include any logo branding within the picture itself, hurting its effectiveness to those not yet in their fan base. In the new Facebook feed, the product picture is prominently displayed on the side of every user’s profile, taking focus off the product’s owner or brand name. Even with a very discreet brand logo on the picture, users’ awareness as to who posted the picture would have greatly increased. In addition, the brand likely would have received new fans to its page. When posting pictures of things like food or drinks, most people are curious as to how these items are produced. 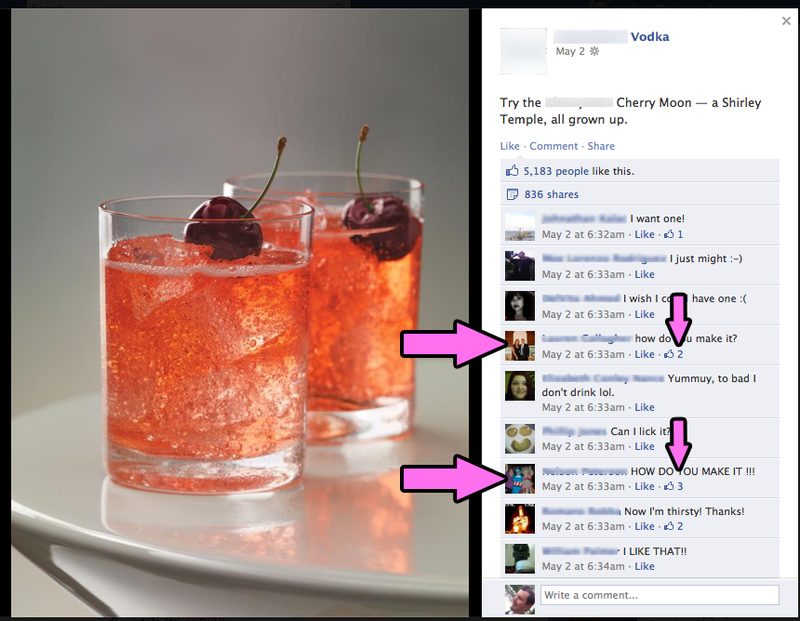 In this instance, the first people on the page asked how the drink in the picture was made. Besides the fact that the lack of response by the vodka disappointed its loyal fans, the missed opportunity to provide information regarding the vodka’s origination inevitably hurt their online presence. In the food and beverage industry, fresh content is often difficult to create. For example, restaurants don’t often revamp their menus, nor do beverage conglomerates frequently release new drink recipes. Since Google gives precedence to sites with fresh content, writing and publishing new, on-topic content for Google to find is always a huge plus to a brand’s marketing scope. This picture received over 800 shares. That means, even if only 20 people saw each share, that’s well over 16,000 opportunities to reach new consumers; thus, harnessing customers’ attention to the website, providing them information about the highlighted product, and creating an opportunity to introduce them to other products and recipes (that, of course, note the searched vodka as a needed ingredient – which brings me to point four…). There are entire websites dedicated to the art of “mixology.” Creating new signature drinks with your product gives you the credibility and authority to garner links from them- one of the most important ranking factors in Google. The links to the recipe, for example, would have been a great way to increase the vodka’s site relevance because other sites providing information about mixed drinks could have linked to it. The moral of this story is simple: you can move the ball all the way down the field, but if you don’t make it inside the endzone, you don’t get any points added to the board and you can’t win the game. It’s important that every piece of a digital marketing plan is integrated with the other components. As companies get bigger, coordinating these parts to effectively work together becomes increasingly difficult. That’s where ubiquitous digital strategy comes in. When you’re ready to tune your marketing machine, give Vuurr a call.